The 21st century has ushered in game-changing technological advances that have transformed the way we learn, live, and work. New technologies, global competition and communication, social networking, and the accelerated growth of knowledge have given rise to an increasingly interconnected world that calls for different learning opportunities and newly designed instruction. As educators, how can we prepare students to succeed and thrive in this rapidly evolving, technology-rich, global community? 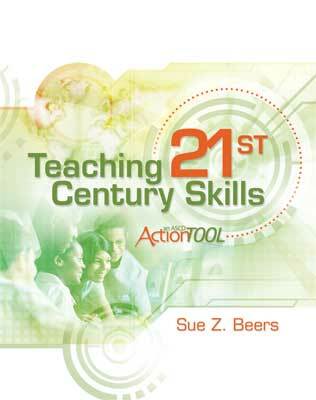 This action tool defines the skills and knowledge that students need for the 21st century and provides tools that you can use with any content to help teach and reinforce those skills. Based on the work of the Partnership for 21st Century Skills, the framework for 21st century learning described in this action tool is built on a foundation of academic subject knowledge that students apply through the essential skills of critical thinking and problem solving, creativity and innovation, communication, and collaboration. Use the instructional planning tools to design a well-rounded set of learning opportunities that integrate the important aspects of 21st century literacies into your lessons. Then choose from 45 ready-to-use classroom tools to help students learn and practice the 21st century skills in any content area. Each tool includes step-by-step instructions, suggestions for integrating technology, and reflection questions that promote students' metacognition. To teach 21st century skills is to teach students a process of thinking about what they are learning. The goal is for students to think independently about content and seek answers to their own questions. The tools and activities in this book can help you guide students through a variety of models and processes that allow them to make analytical thinking routine. With these methods, you ensure that each new generation of learners is equipped for the world of their future—rather than the world of our past. SUE Z. BEERS is the executive director of the Mid-Iowa School Improvement Consortium, a collaboration of approximately 160 school districts in Iowa working together to develop tools and resources for improving teaching and learning. Beers is also a member of the ASCD Faculty, working nationally and internationally with schools in the areas of literacy across the curriculum, 21st century skills, professional development planning, instructional coaching, curriculum planning, differentiated instruction, and assessment.